There’s no denying the tumultuous nature of the current political landscape. Since elected, President Trump has placed intense restrictions on immigration, passed tax cuts that allow wealthy people to pay lower tax rates than middle-class workers, and dismantled parts of the Affordable Care Act, causing a spike in health insurance premiums. Each of the laws the President has upended in the last two years affect all Americans in one way or another. 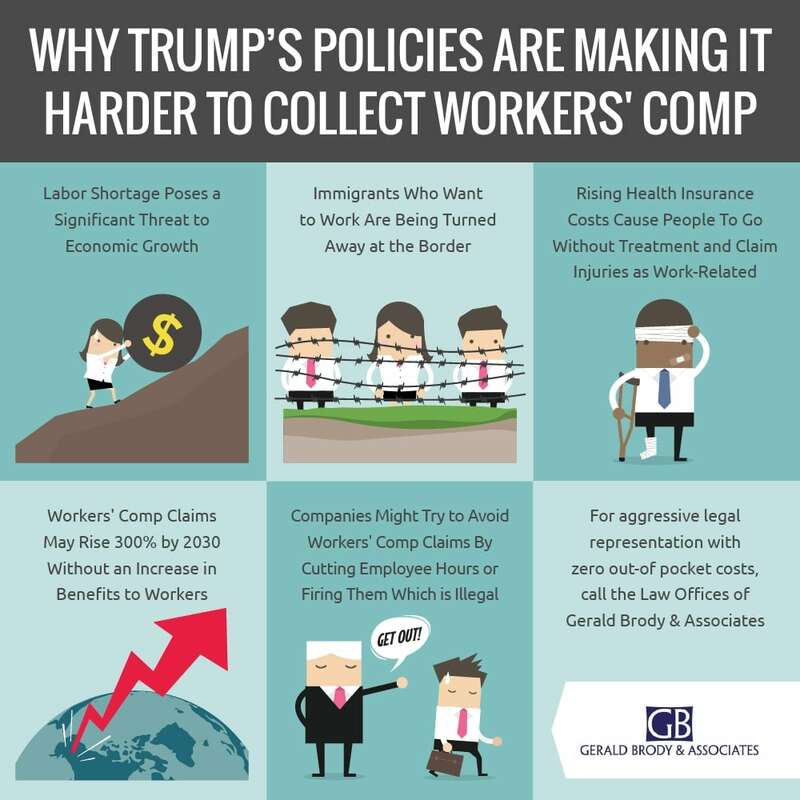 Included are employees who have been hurt on the job; Trump’s policies are making it harder to collect workers’ compensation benefits. For years, economists have been predicting a labor shortage in the U.S. that will pose a significant threat to economic growth. Baby Boomers are retiring and exiting the workforce, leaving thousands of jobs open without people to work them. In the past, this wouldn’t be a problem because the U.S. is a popular place for people to immigrate to. Not anymore. Immigrants who want to come to the U.S. and work are being turned away at the border. Many of those living in the U.S. are either being deported or are too afraid to go to work due to Trump’s crackdown on undocumented immigrants. This labor shortage means many workers are asked to work longer hours, putting them at risk for exhaustion and injury. It also leaves companies no choice but to relax their hiring standards and employ less experienced people. The result: more workers’ compensation claims and higher costs for employers. In addition to a labor shortage made worse by a decline in immigration, rising health insurance costs enacted by the Trump administration pose a problem for workers’ compensation. With deductibles soaring up to $10,000, many people go without seeking medical treatment for an injury or illness. Instead, they may claim their injuries as work-related and try to get workers’ compensation to pay their medical bills out of desperation. This further contributes to the skyrocketing cost of workers’ compensation for employers. According to Dr. Richard Victor, a senior fellow with the Sedgwick Institute, the cost of workers’ compensation claims could rise 300 percent by 2030 without an increase in benefits to workers. This means employers are paying significantly more money to keep the same workers’ compensation insurance they’ve always had. When an injured employee files a workers’ compensation claim, the employer’s premium goes up even more. Naturally, this makes it more likely for companies to minimize or eliminate reported injuries. Because workers’ compensation insurance costs more than it used to, injured workers may be pressured by their employers not to report their injuries. Companies may try to avoid a workers’ compensation claim by threatening to cut an injured worker’s hours or even fire them for reporting an injury. This is illegal. Employees who have been hurt at work have a legal right to collect workers’ compensation benefits that will pay for their medical bills, a portion of their lost income, and retraining for a new job if returning to their former position isn’t an option. If you have suffered a job-related injury and are working through the pain for fear of losing your job, it’s time to file a workers’ compensation claim. Don’t let the current administration’s policies prevent you from collecting the benefits you desperately need. For aggressive legal representation with zero out-of-pocket costs, call the Law Office of Gerald Brody & Associates at (619) 528-9800. While high, premium rates in California have improved over the last few years, keeping in trend with falling workers’ compensation rates nationwide. What does this mean for injured workers? First, it’s important to understand how workers’ compensation insurance works.